When I first read Barbara's book and started following the diet I used the meditation techniques in the book and got some relief from my pain as a result. Yet at about the same time as the meditation CDs turned up I got into such a good routine with my diet that since then I have had hardly any reactions at all. Therefore I have only used the CDs a couple of times, and have not been motivated to use them more often. I picked up your book a week ago and I swear it is going to give me my life back. I'm on day 3 of the juice fast and I am in amazement that I do not have joint pain. I cannot remember the last time I have not had constant bone-crushing pain in my hands, ankles, neck, not to mention the accompanying fatigue and inflammation pain. I cannot believe what a "fool" I have been for the last 12 + years that I listened to "Western Drs." who told me they had done all they could for me. I've already told 2 friends they have to get your book and trust me I want to go out with a bull horn to tell more people. After scouring the internet, I ran across Barbara's story. I called her and we talked about a program for healing. To my surprise she suggested I go on medication temporarily to prevent long term damage. I try and avoid aspirin much less the toxic medications that are prescribed for arthritis. But the fact that she was not attached to any one approach of healing convinced me that she knew exactly what she was doing. Others I had spoken to were exclusively holistic but my symptoms seemed far beyond a holistic cure at this point. I told Barbara I would do exactly what she told me and stick to any diet she advised. I took the ALCAT test and we created a 6 month diet that would have me avoiding foods I was sensitive to. I started Humira injections about the same time as the diet with the plan to wean my self off the medication as the diet healed me. It is now 180 days since I have had a Humira shot and I am 95% pain free. I am due for another ALCAT test as I believe I have developed some food sensitivities recently that are causing some minor twinges but I am fully active and in very good shape. My Dr. refuses to give the diet any credit but at the same time is impressed with my recovery and his diagnosis that I would be on medication until the day I die. Without Barbara I would most likely had been relegated to the toxic, expensive medications that were offered. She was very patient and was the lone voice of hope in the early dark days of my diagnosis. I strongly urge anyone who is struggling with this disease to seek her help. I am available via email for questions if you have any. Please ask Barbara for my contact info. "I got on the internet and found your book and I have been working on my situation for about a year now. I started with fasting and eliminating suspect foods. I, then, isolated foods that triggered a food intolerance reaction. I started having positive results from the first week and have increasingly gotten much better." "At the time, I alternated between crutches and a wheelchair and spent most of my days trapped in bed icing my knees, ankles, and hands as I suffered inflammatory attacks throughout the day...With a tailored diet from ALCAT results and Humira I'm now able to function normally again, only four months after my initial, severe onset of arthritis." "Chronic pain, by its nature, becomes something we too often learn to adapt to and live with, something we begin to define as normal. After a bad bout with my arthritis, it is always amazing to me to rediscover the freedom of being pain free and the joy of moving my body with flexibility and grace. Allan's book provides the knowledge, approach, and vision to turn the tide so that such moments come ever more strongly into being. She takes the chronic out of pain, reminding us that it is the nature of life to change and it is the nature of humans to rise to the challenge." "I met Barbara when she came to our lab as a graduate student to work on her PhD. I saw all the misery she went through when she was hit so hard with the pain of arthritis. I didn't know what to tell her when her doctor told her that her pain was all in her head and that she needed to get over it. I saw her getting so bad that she had to use a wheelchair. And then I saw her start to get better and better. I was totally amazed the day I saw her running in Tower Grove Park." 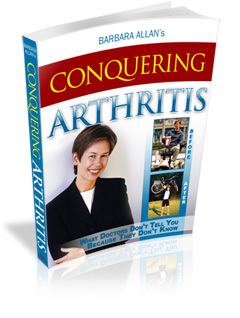 "This book is the best book I have ever read about arthritis. I know the author and I knew her before she was cured and after so I know what an amazing change she was able to make in her life. I have mild arthritis and have found her advice more helpful than anything a doctor ever told me." "A month ago, overnight I developed a severe arthritic reaction/condition. Within 2 weeks I had discovered, ordered and received your book. I read it immediately and implemented as many 'secrets' as I was able to. In the last 2 weeks I have gone from being completely unable to walk, to walking pain free, symptom free!" Just fill out the form below and/or call 623-850-1360 to leave a voice message detailing your success. I got rid of knee pain when I went back to what I knew and added juicing to my regimen. Pain gone!